For those who have followed the blog, you may recall that I am an aspiring author. For almost a year, I have been trying to get published my first book entitled, Heaven on Earth: Stories of Fly-fishing, Fun and Faith. I have learned that rejection is a big part of the writing process, but I am still hopeful that this will pan out. I’ll keep you posted. 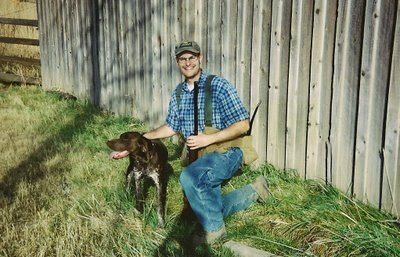 This Summer, I sent the Pointing Dog Journal (“PDJ”) an original story called, “Grouseketeers,” about taking my son blue grouse hunting for the first time in 2007. PDJ’s editor wrote me back and said they would not take it in its original form, but might consider it in a shortened version. To that end, I hacked the 2000 word story to 800 words. Believe me, it was no easy feat, but I persevered and resubmitted it. The end result was a bare bones version of the original and I could not help but feel that it had lost its essence. As an afterthought, I also submitted to PDJ “Upland Rooster” (regarding my first bird dog, Rooty), which piece I wrote for the blog. Lo and behold, PDJ accepted, “Upland Rooster,” rather than “Grouseketeers,” for publication in the Subscriber Forum in the March/April, 2009 issue. This will be my first official outdoor story publication! I am really excited to cross the threshhold and glad that Rooty’s story will be widely read. What a great tribute to him! At the same time, I am bummed about “Grouseketeers.” The success of one story at the expense of the other is sort of like a parent having to pick one child over the other. Notwithstanding, I am still hopeful for “Grouseketeers” and will submit it to other magazines in its original form. The main thing I have learned about writing is that you have to be persistent. Andy, This is sweet! I love all of your writings!! You should continue on! If you keep it up, you are going to “force” me to get my own bird dog and to get out there more often. Personally, I really liked Grousekateers……”Daddy, can you shoot the gun softer?”….ha, ha!